I bloody LOVE an RPG, so I’m a massive fan of the Dragon Age series of consolegames. Developers Electronic Arts have managed to do something that so many other games designers fail: mix great gameplay with properly gripping stories and layered, nuanced characterisation. And let’s be honest: who can resist the gentle simpleton / absolute psychopath that is Sandal and his ‘Enchantments!’ Or Anders, the kindly mage / absolute psychopath with boyish good looks and his trusty cat Ser Pounce-a-lot? Or Merrill the Dalish (Welsh) elven mage who was voiced by that woman off Torchwood? Generally, however, I’m not such a fan of the game-to-novel adaptation or spin-off. Or novels that become games. Point in case: The Witcher. Awesome game…novels not so much. Resident Evil? About as scary as making toast. And don’t get me started on the Tomb Raider novels, that are so bad they actually put me off the games I’d loved so dearly for over 20 years. So I’m going to have to admit straight off that I went into this with low expectations. Conversely, I did ask to review this book, so I’m either a masochist or I’m praying for something to break the amazing-game-makes-crappy-books curse. As the young people once said: ‘go figure’. Suffice to say that the curse is now broken. 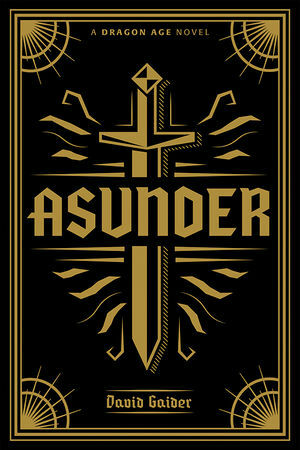 Asunder is stunning. At its core, the story toys with the idea of being able to reverse the Rite of Tranquility, a sterilisation ritual of sorts, that leaves mages completely emotionless and unable to cast spells – or to be possessed by demons. Reversing the Rite compromises both the Templars and the Chantry, leaving them with no way of controlling (potentially) dangerous mages. That said, the key narrative revolves around Wynne (a playable character from Dragon Age Origins, the first game in the Dragon Age universe). Wynne’s a healer who, in Asunder, travels with a party to rescue a friend from an old Warden Keep. But Wynne-Fans beware: she has changed a lot since Origins. So if you like the curmudgeonly but ‘grandmotherly’ healer, you might be disappointed to find her transformed into a cold, hard-hearted crusader throughout much of the book. Don’t let that put you off though – there’s a beautifully written ‘softening’ of Wynne’s character towards the end of the book. Meanwhile, other characters ranging from Rhys, Wynne’s charming joker of a son, through to the story’s villain, Lord Seeker Lambert, (the pinnacle of mage-hate), are all properly rounded characters, and tremendous fun to read. Each of the book’s locations are exquisitely described too: from the White Spire Circle of Magi in Val Royeaux, with its dark, foreboding atmosphere and even darker ‘Pit’, to the dusty purple desert of the Western Approach and the demon-ravaged halls of Adamant Fortress, it’s probably a cliché, but worth saying again: you really do feel as if you have been transported to the Dragon Age universe.